He's come a long way since his band's first memorable cheeky yelp of a debut filled Radio 1's playlist some 20 years ago. With the most poignant lyrics about harsh realities of mis-spent youth and the 'coming-of-age' since Madness' 'Baggy Trousers' (and 'House of Fun', for that matter), 'Caught By The Fuzz' was as great a leap from the starting blocks as you could wish to hear. 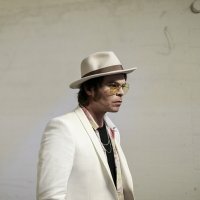 'Caught by the fuzz/I was still on a buzz/in the back of the van/with my head in my hands' - sheer Gaz Coombes poetry with a bit of Danny Goffey and Mick Quinn stirred in. Eventually, Supergrass turned from spunky laureates of innocence and insolence ('Alright' paid the bills, 'Sun Hits The Sky' paved the way) to poignant purveyors of meaningful art ('St Petersburg', anyone? ), recently eschewing all sense of maturity to blaze a trail of glam with some 'Diamond Hoo Ha'. In fact, Supergrass have knocked out an impressive catalogue, peaks, troughs and compilations all. They say that trios have all the best fun (and tunes). Since splitting in 2010, the various members have been flirting with danger (Mick Quinn's holiday accident, Danny Goffey's stint on Celebrity Masterchef) and other musical projects. Quinn formed Beat Seeking Missiles and Goffey teamed up with Gaz Coombes to form the temporary glamsters, The Diamond Hoo Ha Men (named after that swansong album). In amongst all of this activity, it's hardly surprising to learn of Coombes own solo project, a recently issued album 'Here Come The Bombs'. Now free of major-label interferences, Coombes' debut is a bright brash young-not-young thing and should translate well on his solo tour in the autumn. First stop is Newcastle on 17th October, followed by Manchester, Leeds and more cities until Bristol on 28th October. The London show is at XOYO and therefore liable to sell out fast. We will have tickets for all shows from 9am on Friday 13th July, priced from £12.50 to £13.50.